211 Bernard: This shelf belongs to...Tess Liem! This shelf belongs to...Tess Liem! Each month, Librairie Drawn & Quarterly invites a local author or artist to curate a shelf in the store. This September, we bring you recommendations from Tess Liem! 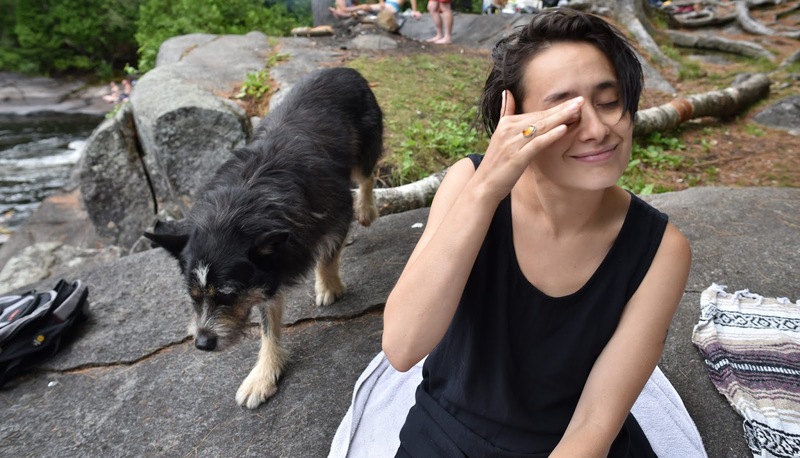 Tess Liem is a queer writer living in Montreal, Tiotia:ke, the traditional territory of the Mohawk nation. She is the author of the chapbook Tell everybody I say hi (Anstruther 2017) and her writing has appeared in Plenitude, Room Magazine, PRISM, Best Canadian Poetry 2018 and elsewhere. Her essay "Rice Cracker" won the Constance Rooke Creative Nonfiction Prize in 2015. Her new collection of poems, OBITS, is available from Coach House Books. 1. Holy Wild by Gwen BenawayThese are poems of experience, poems of recovering language and recovering oneself. They are poems of love and violence. Benaway describes this collection best herself: “my poetry acts as the mediator between the world and my body, my ancestors and my gender.” On first read my favourite poem is “Root,” but I’ve already folded down the corners of most of the pages of this book. 2. Dear friend, from My Life I Write to You in Your Life byYiyun LiThis is the kind of memoir which is fascinated with books, or the kind of criticism which is fascinated with being a sad person. Li talks about her favourite writers, and two instances of checking herself into the psych ward. This is an incredibly sensitive and refreshing reflection on a life that is filled with a love of every unit of language co-existing with the realities of chronic depression. 3. What is Not Yours is Not Yours by Helen OyeyemiWhat makes the stories in Oyeyemi’s book so enjoyable is their ability to make me feel as though I am teetering between an uncanny, familiar world and one that is always slightly shifting, is always hinting at its fantastic elements. Oyeyemi's stories are smart, wryly funny, and often punch-you-in-your-guts-with-a-feeling good. Really, just read anything by her. 4. nîtisânak by Lindsay NixonSince this book was announced, I’ve read whatever essays I could find by Nixon. Their writing is just so smart, so thoughtful, and writing about queer Indigenous ethics, life, and loss is important(!). To read their writing is to truly be in some talented hands. 5. We're Not Going to Do Better Next Time by Lauren TurnerTurner skillfully renews the story of Samson and Delilah and the concerns of this chapbook are urgent and necessary. Don’t worry about the original story though, you already know it, maybe you've lived it. These poems sparkle, sharpen, and cut. Get a copy of this while you can, before LT gets famous. 6. How does a single blade of grass thank the sun? by Doretta LauLau casually sneaks you into her delightfully bizarre premises—like communicative time travel—and out again without effort or explanation because these stories share in elements of humour, wonder, and the often (or always!) quietly painful inner lives of her characters. What’s more is that sometimes these characters get resolve, sometimes they are relieved, and one reviewer said those types of endings are weak, but I think he was totally wrong. 7. You Are Not Dead by Wendy XuIn my favourite poem in this collection, Xu writes, “I don’t know if you understand me when I say hopefully there is a future and we are both allowed in it.” I am stunned by how Xu strings sentences together, how she can pull off shifting from the subtly absurd to the pointedly hopeful to the tree that is a ship that is your memory. These poems are songs, they are studies in how to write poetry that makes you feel like living. 8. Boundless by Jillian TamakiI listened to Tamaki talk to Aliya Pabani on a podcast called Imposter. Pabani asked, “how do you draw sound?” and I don’t know, I guess you’ll have to read the book to find out the answer. Whether or not you're interested in such a question, you won't be disappointed.